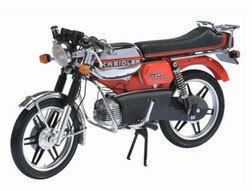 Some Kreidler Motorcycle Manuals PDF are above the page. Kreidler Werke, a company based in the suburbs of Stuttgart, specialized in the manufacture of metal semi-finished products (pipes, castings, stamping, etc.) for the German engineering industry. Nevertheless, in 1951 the company's emblem appeared on the moped "K50". 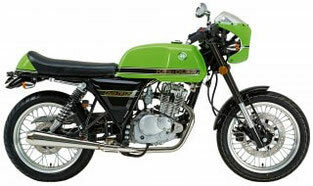 Single-cylinder two-stroke 49-cc engine capacity of 2 hp. was interlocked with a two-speed gearbox (the change was made with the help of a rotary handle of the steering wheel) and was started with bicycle type pedals. The power unit was suspended from the frame bent in the form of a letter "U" from a pipe of large diameter. Front stood a simple telescopic fork, the rear wheel was fixed rigidly. Soon there was also a "luxury" modification "K51" with a short-front fork, rear pendulum suspension and a motor, covered with stamped panels. Cheap and well-made, these machines immediately provided the company with a good reputation and high incomes. In the fall of 1955, the scooterette "R50" supplemented the range of two mopeds. It was a chassis "K50", covered with stamped lining with a small front shield and a polikom under your feet; kickstarter has replaced pedals of a bicycle type. But the main novelty of the season - modernized engines, which began to install on all three models. For the first time in the practice of motorcycle motors it was possible to get rid of the cartridge: it was replaced by a layer of solid chromium. The company introduced a brand-new machine in 1957. The Florett model was claimed as a light motorcycle: it developed a top speed of 65 km / h with a limitation of 40 km / h for mopeds. A two-stroke 49-cub. Engine with a horizontal cylinder arrangement developed power of 3 hp. and was interlocked with a three-speed transmission. It still had a gearshift mechanism with the help of a rotary handlebar. The mirror of the cylinder was covered with hard chrome. The frame has retained the U-shape, but was now manufactured from stamped parts. However, the opening was almost completely closed by the established "on-motorcycle" horizontal gasoline tank. Front stood a long-fork type Earles, rear - a pendulum suspension. The motorcycle was distinguished by excellent manufacturing quality, modern - for those times - appearance and outstanding economy. All this made him the leader of the German market and neighboring countries. An unusual advertising move also played its role: the company promised to give a gold tie clip to everyone who traveled on a 100,000 km Kreidler motorcycle and fulfilled this promise until the end of the 1970s. And in order to constantly stir up interest in their products, the company has developed a wide range of sports activities. Already in 1959 on the basis of a serial model motorcycles for multi-day motorcycle competitions and highway-ring races were created. The first success came in the Six-Day FIM competition in 1960: several German athletes performing at Kreidler won gold medals. Sports success overshadowed the company's management the need to improve serial production. In fact, the basis of the model range was still the same "Florett", in 1976 received an electronic ignition system, cast wheels and a disc front brake. Only the drop in demand in the late 70's forced the hurry to take up the development of new models. At the end of 1980, the light Flott motor bike debuted with a traditional 50-cc horizontal engine suspended to a tubular frame, and a series with a completely new vertical 79-cc engine with 8 hp. - road "Florette 80" and a motorcycle of dual purpose "Mustang 80". Alas, these efforts could no longer save the company, which in 1982 announced the elimination of motor production. Ironically, the brand continued to win the competition even after its official disappearance: on the Kreidler motorcycle the Swiss Stefan Dorflinger won the world championships in 1982 and 1983. These titles became the merit of the German company "Krauser", a well-known manufacturer of motorcycle accessories, which bought the racing team after the bankruptcy of Kreidler.